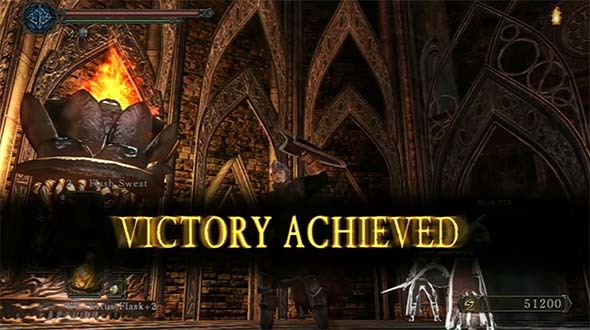 Hot off of playing Bloodborne's The Old Hunters DLC, and with Dark Souls III just over the horizon, I thought I'd get myself hyped up by playing through the re-release of Dark Souls II, Scholar of the First Sin. This version of the game is a next-gen enhancement of the original game that was released on the PS3, XBox 360, and PC a year prior, and it includes improved graphics, faster frame rate, and more challenging enemy-placement. It's available on PS4, XBox One, and PC, and is treated as a completely different game as the original version. 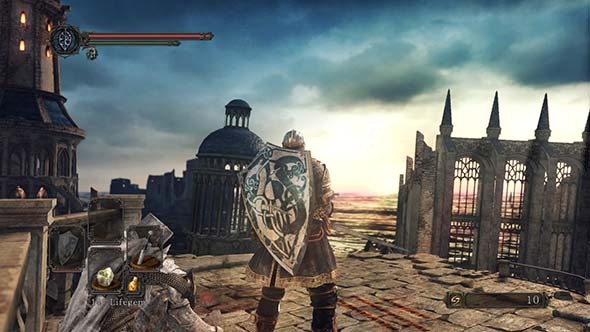 It's not a DLC or a patch update (though it does include all three of Dark Souls II's DLC content). Scholar of the First Sin looks much smoother in motion, with higher resolution and framerate. Lighting and textures are (at best) only marginally improved from the last-gen release. I was honestly expecting Scholar of the First Sin's graphics to be considerably better than they are. In fact, I honestly don't think the graphics are much better than the last-gen release; I think the only difference is that it displays at full 1080 resolution and plays at a high end of 60 frames per second. Colors are a little more vibrant, and the game doesn't look as washed-out, but models and environments don't seem any more complex, and textures are only maybe slightly more detailed. Unfortunately, darkness still isn't as dark as it needs to be to make the torch as necessary for exploration as it was apparently intended to be. 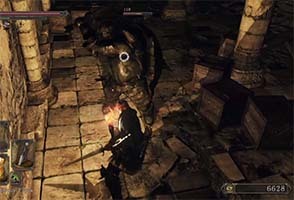 In pre-release demos, darkness was implied to be a complete fade to black that rendered objects within the dark invisible. Simply adjusting the brightness of your TV wouldn't change that. 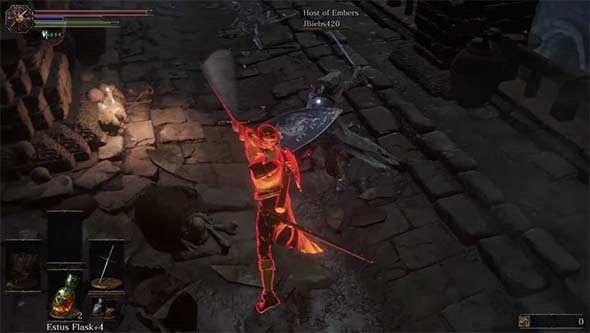 In the released version, darkness doesn't go completely black, so objects are only hidden if your TV brightness is low - lower than the recommended brightness level of the game. Even then, the release game looks brighter, and Scholar of the First Sin does very little to change that. 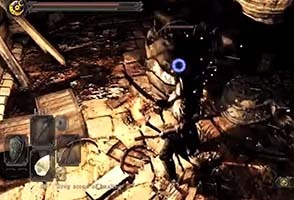 This graphical downgrade, the complete failure of FROM or Namco/Bandai to inform the public about it, and the resultant misleading marketing that repeatedly showed demos, screenshots, and footage that wasn't representative of the final product left a huge negative impression on a lot of players - especially those who pre-ordered it. That poor initial taste is probably a huge part of the reason why this game has gotten such a negative reception, even though that negative reception is mostly warranted. Scholar of the First Sin was an opportunity to wash that bad taste out of consumers' mouths and give us the game that was advertised, marketed, and pre-ordered. But Namco and FROM didn't bother. Darkness is just rarely ever a meaningful component of the gameplay. 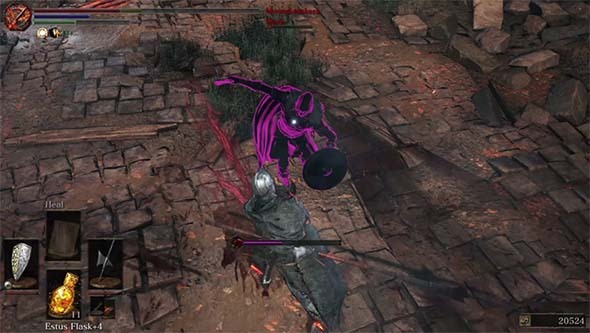 Darkness may lower the range of target locks though, so even though I could plainly see enemies, I felt like I wasn't able to target lock them as readily as I could in the PS3 version. Even so, there's enough sconces laying around that you can light a sconce, extinguish your torch to fight, then re-light it at the sconce after all the enemies have been dispatched. It ends up just being some extra overhead if you care enough to bother with it, and not an essential element of gameplay. ... FINAL PRODUCT shows low contrast between light and dark, frequent repeated textures, and simplified geometry. Textures, character models, and world geometry don't look noticeably better. 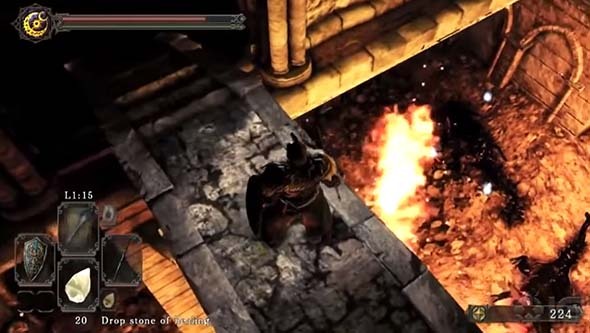 Many areas still have generally blander textures than what was presented in pre-release videos, and the textures noticeably repeat. World geometry also seems less detailed and intricate compared to pre-release videos, which takes away a lot of the personality that these preview areas exhibited. I was expecting Scholar of the First Sin to restore many of these superior textures and models from the previews, and I'm really disappointed that the game doesn't look better than it does. and creatures more threatening and mysterious than in the release build [RIGHT]. The improved textures also don't do much to help the game's generally bland art design. There aren't many visually-appealing locations in the game, as they are all just variations of run-down castles and forest paths. Most of them have pretty sparsely-decorated hallways with simple geometry that has little-to-no personality. There's nothing here that even approaches the ominousness of Demon's Souls' Latria, and the oppressive environments of Bloodborne make Dark Souls II almost serene by comparison. Again, Scholar of the First Sin does little-to-nothing to address this. No Man's Wharf probably remains my favorite location in this game, as it's one of the few locations that takes place in a fairly unique setting that actually utilizes light and dark for gameplay purposes. As part of my review for this game's DLC (Artorias of the Abyss), I have decided to re-evaluate the score (using the new scoring system). My opinions about this game have changed a bit over the past couple years (in a positive way), and so I am including an updated score and several pieces of hindsight commentary to explain where my original criticisms may have been flawed or unjustified. Locations that include hindsight commentary have been notated in the Table of Contents. 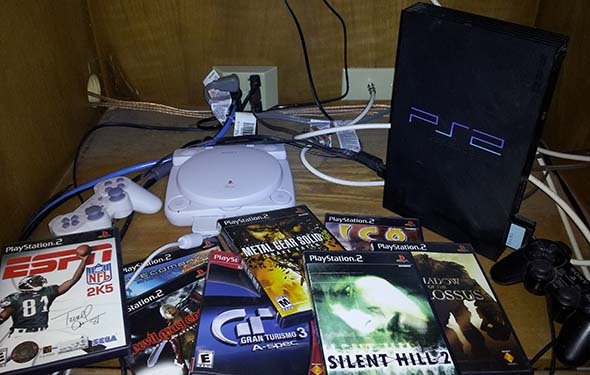 If you had asked me in the middle of 2011 what my favorite games on the PS3 were, three of the games that I would have named would have been: Uncharted 2, Demon’s Souls, and Batman: Arkham Asylum. All three of these games received sequels or follow-ups in the fall of 2011, so it was a pretty exciting holiday season for me in terms of gaming. Batman: Arkham City and Uncharted 3 were both very good games, but didn’t quite live up to my (possibly unjustifiably) high expectations. 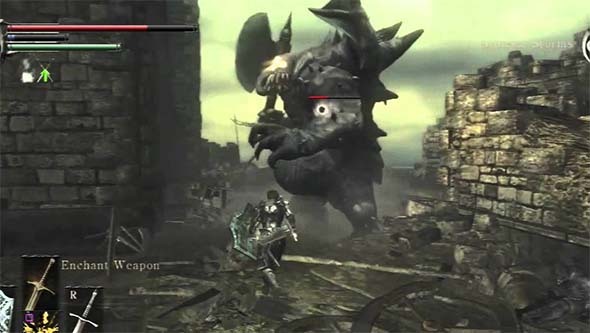 Sadly, Dark Souls ended up suffering a similar fate Dark Souls disappointed me with its initial impressions, but in the years since, has proven itself to be almost every bit as good (although not as elegant in its gameplay) as Demon's Souls. I wanted to try to finish the game’s story and play through large chunks with several different character classes before coming to a final verdict. I wanted to see what kind of post-release support the game received. I wanted to have several opportunities to engage in PvP encounters. But hey! A PC port is likely due out soon, so maybe people considering the PC version will still find this review useful! 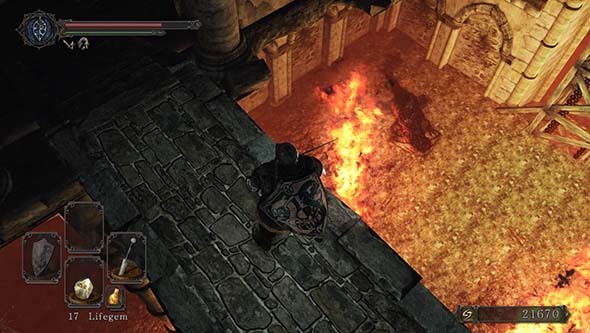 Does it live up to Demon's Souls' brutal difficulty?